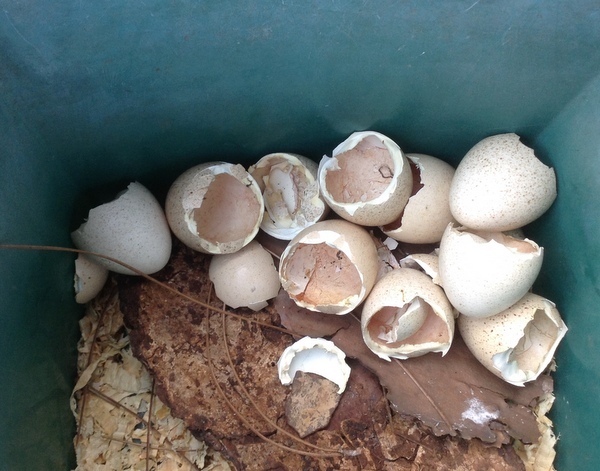 This page is mostly about the "problems" associated with turkey eggs in an outside nest, although much of the information does cross over to using an incubator. Weather: Until the hen begins sitting; hot, cold and rainy weather have little impact on the viability of the turkey eggs. Once the hen “begins” the sitting phase, hot weather has the greatest affect upon the egg viability and the mid to late summer hatchings, only one quarter of the eggs will hatch (compared to 95% hatching in the spring) Rain storms or cold snaps have almost no impact upon the eggs while the hen is setting, as the eggs are protected by the mothers’ body heat. Just in time. This crushed egg "cheeped" at me when I pulled it from under the hen. The baby is doing fine. Rarely do I time it that the baby turkey is still alive. A crushed egg - in layman’s words: “Collapse of the perfect container”, that is the egg is a miracle in action: strong and yet thin. However.....The moment the turkey poult “pips” chips a hole in the egg, the miracle strength is suddenly gone & often two or three eggs will get crushed before the poults can escape. Note:The more blood in the egg, the less chance the turkey will survive. 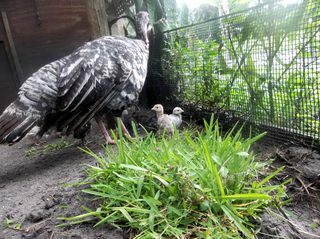 The 'premature' poults: I only suggest an incubator because the "premies" require a more calm environment while they continue their development. Also, the incubator is cleaner. However of all you have is the turkey mother, go ahead and chance it. Reminder: Roots: as mentioned on another page Turkey nests, roots in the nest can cause over a 50% loss of poults. Removal of roots (or shifting of nest) is imperative. 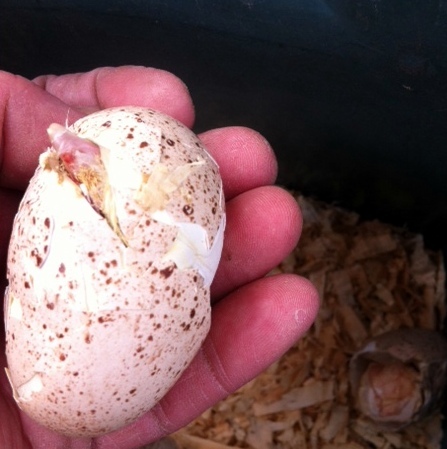 Even with no roots, the turkey’s leg bone will cause some eggs to crush just as the poult is attempting to escape. Manually removing the cap from a crushed egg. Cap: The Poult chips the egg cap off, yet cannot crawl out of the egg. The baby turkey perishes surprisingly fast if it cannot slither out of their perfect container. This actually only seems to be a problem in a nest with a lot of eggs or a cone shaped nest. One of the things I do during a 27th day inspection, is to shift the eggs that will be hatching first, (obvious marks or pecking) so their ‘caps’ (the fat end of the egg) are pointed outward and the baby turkey escapes more easily. 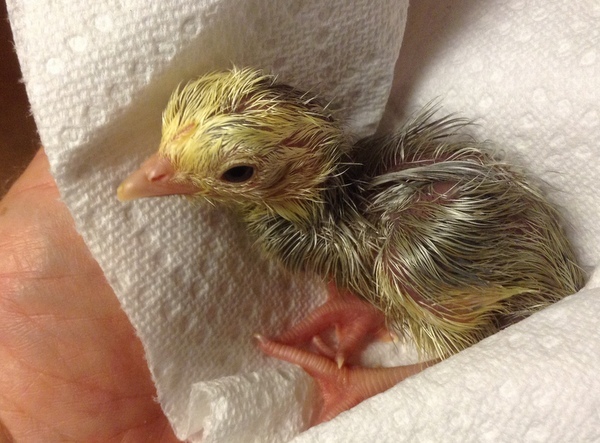 I placed this 'late hatching' (overdue) egg in the incubator. Hatched a week late! The poult was able to chip the cap off, but could not slide free without my help. Note the tape on the egg I used to identify it from the other eggs in the incubator. The baby is doing fine, following the hens around with the other poults. Finally Fire ants, the bane of the southeast. I have been told that the reduced wild quail population in east central Florida is directly related to fire ants. The scenario is as follows: the baby bird chips a breathing hole in the egg and the fire ants invade, killing the bird. So far, I have only seen this happen about 3 times with the turkeys. (Statistically nearly zero) Still it saddens me to find a otherwise healthy poult killed by ants. The only suggestion I have is remove shell and any deceased birds from the nest as promptly as possible. 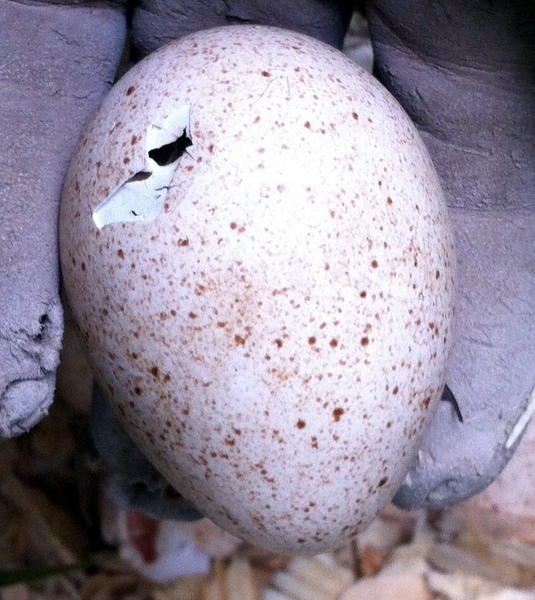 Periodically during the 28 day incubation period, visually check the eggs and nest. Lift the turkey hen during the inspection. 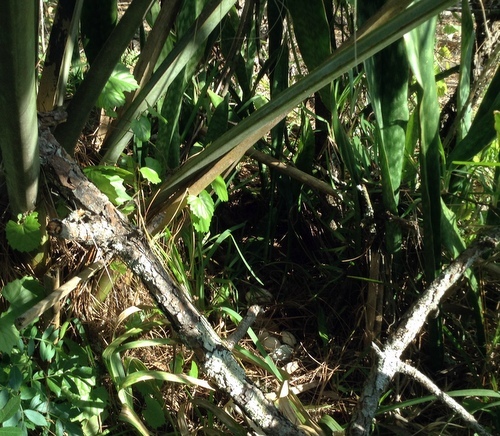 Look for signs that would indicate nocturnal predation: Broken eggs & feathers in the area. Count the eggs and examine the mother for health problems. You will wish to protect your hands and arms before checking the eggs: wear leather gloves & a long sleeve shirt. I use an old style leather archery arm guard for protection from the hen’s sharp beak, for she will draw blood. During the inspection the hen will guard the nest by pecking at your hand, however she will not normally leave the eggs--she will hiss, fluff, peck and be angry, yet you can easily lift her up and check the eggs. Note the wrist guard and gloves. Of course the other option is to inspect the nest when the hen leaves to drink and eat. But for the hens health: If you decided to wait until she leaves the nest for a drink of water, “Do not” approach the nest if she can see you. This will only cause her to give up eating and drinking for the day and run back to protect her eggs. 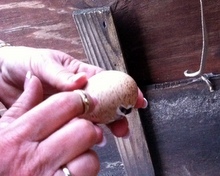 Around the twenty-fourth day, inspect the large end of the eggs for signs of hatching. You may notice a slight mark being pressed outward. At this time you can place an egg to your ear. You may hear a quiet but steady tapping as the poult attempts to chip its way out. Around the twenty-fifth day, turn on the incubator if you have one, giving you time to verify the correct temperature and operation. Also it is not uncommon for several eggs to hatch later than the 28th day and a warm incubator gives you the option to make the attempt to hatch the egg. Around the twenty-sixth day, you will notice the slight bulge has tripled in size and occasionally you will hear a chirp emanating from the egg. Note: For boh wild turkeys and the back yard heritage turkey. Day 26-28 is usually the greatest time of peril for the mother hen and eggs. As all predators, investigate the chirping coming from inside the eggs. Also if you have other hens, you may notice them ‘hanging around’ the nest location, because the turkeys also hear the new poults chirping & thereby attracting the hens. Around day 27, the dent in the egg will have been enlarged into a breathing hole and if you pick up the egg, you can see the feathers or poult. Fully developed poult has chipped out an breathing hole. The poult will be chirping in the egg at this point and inadvertenly calling in predators on the final night. 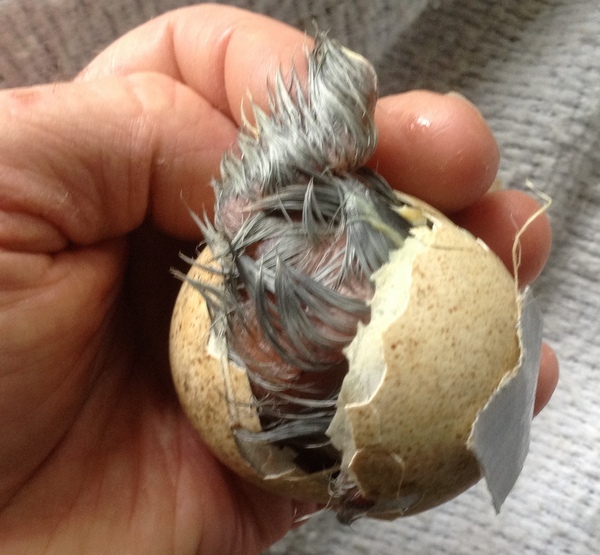 Around day 28 the poult will have completed its escape and slipped out its shell. Remove empty shells to reduce ant attraction and create more space under the hen for the other eggs to hatch. This is a trying time for the mother hen, as she is already starved and dehydrated and as the eggs hatch out, the hen will not leave the newly hatched eggs for food and water. 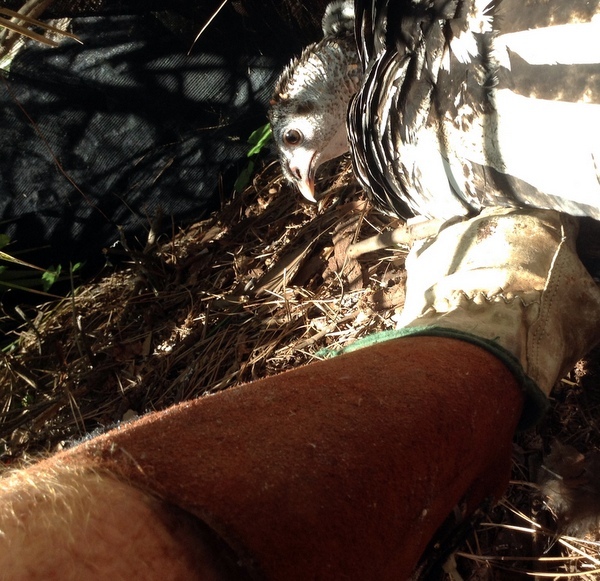 Generally only a deceased poult will cause her to leave and carry the dead turkey from her nest. 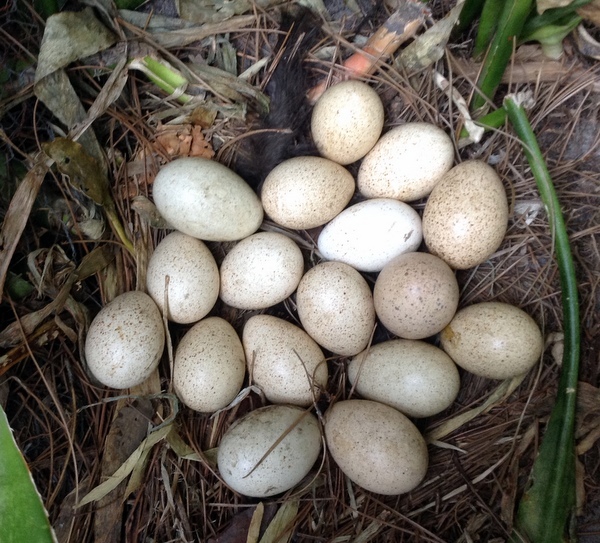 I knew this nest of eggs were due in few days & as I was about to inspect the nest.... I hear a "pop"
One of the eggs was rotten and it had just burst under the hen drenching the mom and eggs with foulness. Soon the hen came off the nest and waiting until she could not see me, I set aside all of her eggs and scooped up the fouled pine needles the eggs had been resting on. Next I carried a small amount of clean pine shavings to the nest and made a new bed. Lastly I wiped each egg with a dry paper towel, as well as identifying two more rotten eggs. I was just finishing up as the mother returned from a much needed dust bath. The eggs are hatching out as I type. More or less on time. In an hour or so I will pick up the mother and poults and carry them to an indoor pen---weather forecast is for rain on Monday, otherwise I would place them in an outdoor pen. This poult was not only a week late, (he or she) was peeping at the wrong end! 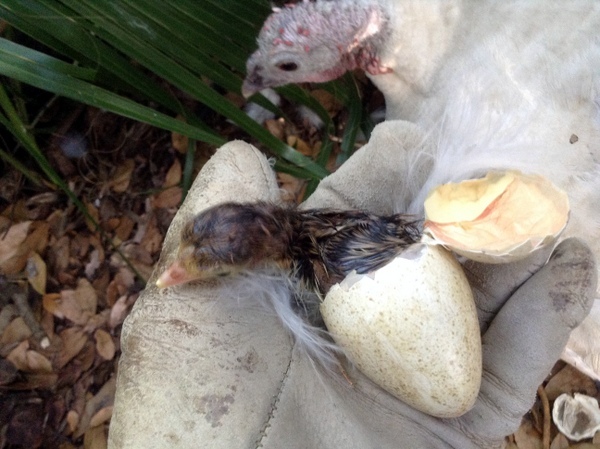 I have seen turkeys hatch successfully from the wrong end of egg, so I just watched. However after 8 hours of not cutting past a large air hole, I opened the egg. Opening the egg is something I avoid, however being a week overdue, I was worried. When I peeled back the shell, the little bird's back was dried to the shell and it could not spin and peck, to cut out of the egg. It is doing fine under mom! This page was mostly about the outside "physical aspects" of the egg. However what if you need to assist in the hatching? Really great Animation of a Chicken Embryo Development 21 days. Finally, what if the eggs do not hatch? Perform the "Cold Test" or "Candle the eggs"